An additional source of biotin. It promotes normalization of central nervous system and gastrointestinal tract functioning, normalization of metabolic processes in the body, improvement of hair, skin and nails condition. Biotin – 150.0 mcg, excipients. Biotin (vitamin H, vitamin B7) is a water-soluble vitamin from vitamin B-complex. Biotin takes active part in lipid, protein and carbohydrate metabolisms in the body and is one of the elements, which are necessary for normal growth and development of body cells. 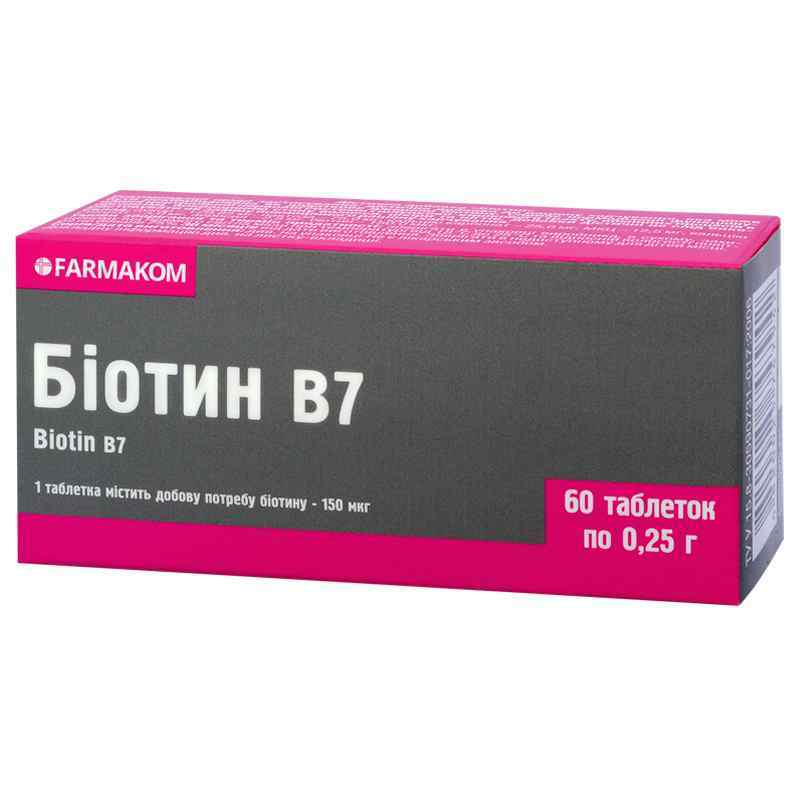 By reacting with insulin, vitamin B7 normalizes blood sugar level, what is of particular importance in case of diabetes mellitus. Biotin is necessary for normal functioning of the nervous system, which cells need glucose. Together with folic, pantothenic acids, as well as cobalamin (and other B-vitamins) it improves body nervous system functioning. Its insufficiency is manifested in irritability, nervosity, rapid fatigability, insomnia. Biotin belongs to beauty vitamins. Being a source of sulfur in the body, biotin provides positive effect on the state of the hair, the skin and the nails: it prevents their fragility, contributes to improvement of growth of hair and nails, prevents their peeling, hampers hair loss, normalizes sebaceous glands functioning. Adults take 1 tablet with food with sufficient amount of water. Term of use is one month. Further, the term of use and the possibility of repeated use are to be agreed with a doctor. Individual sensitivity to certain components, pregnancy, lactation, children under 12. Proteins – 0 g, carbohydrates – 86 g, fats – 0 g.